Your garage may be your sanctuary when you need to get away from it all, but if it’s cold and dreary outside, it’s not fit for even the toughest constitutions. That’s when a little supplemental heat from a portable space heater can really make all the difference, especially for outdoor spaces that only get used occasionally. Unfortunately, space heaters don’t exactly have the best reputation. Propane and natural gas heaters rely on nonrenewable fuels, which aren’t the best for the environment. And they can quickly become a fire hazard, as well. In fact, even if you go with an electric unit, you’re still adding to your carbon footprint if your home’s energy comes from a coal-derived power grid. A solar space heater gives your garage workshop a little kick of sustainable energy—and if you play your cards right, a DIY heater or ducted system can even make for a new project, if you need something new to tinker around with. Here are some of the benefits of solar space heaters, and what you need to know about selecting and installing them—as well as how to build your own! Solar Infra Systems is one of the most popular solar space heater manufacturers. Their portable interior/exterior heater has a small solar panel that can be mounted to an exterior wall, on a window, or placed on an accompanying stand. A window-mounted unit is a great choice if you live in a sunny area—and especially if your garage faces due south, where it will receive the maximum amount of sunlight. However, you can also mount the panel on any exterior wall on your garage, as well, and, if you’re feeling really ambitious, you can duct the unit to direct heat into the interiors. To do this, you’ll need to purchase a three-inch flexible duct hose which can be attached to matching ports on the outside of the heater. Then cut a low entrance in the wall for the hose to push heated air from the heater into your home. There are also a number of mounted infrared solar patio heaters that could easily be used toward the same purpose. Or, a third option would be to convert a traditional electric space heater to solar by plugging it into a portable solar panel. 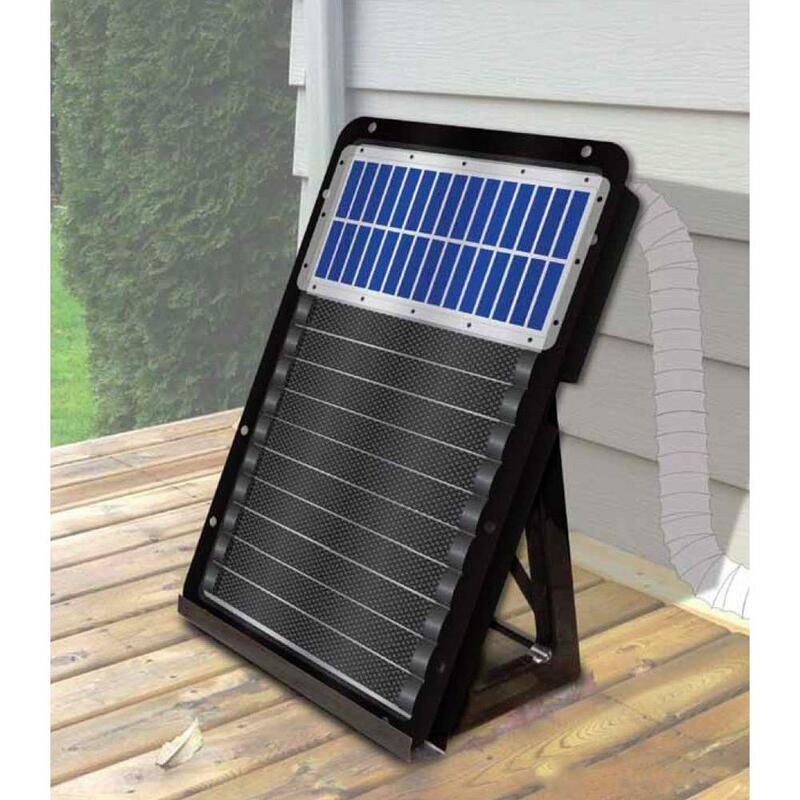 Low-to-medium-watt panels designed for camping and outdoor applications are perfect for this end—and going with an electrical heater means you never have to worry about running out of heat if you need to work inside your garage at night. You can just plug it into an electrical outlet and go. Either way, you’ll still be offsetting some of your heating costs—and investing in some top notch gadgetry. By now, you may have noticed that a majority of the heaters mentioned above are what are known as infrared heaters. This heating system uses light on the infrared spectrum to warm rooms (and the people inside them). In this way, it’s a lot like sunlight. Some infrared systems employ radiant heating—that is, the heat projects from the unit and radiates out onto whatever happens to be nearby. And some have more complicated systems with internal fans that blow heat across a space. Companies that make infrared heaters say this system is super efficient—and tout the green benefits of their products, since they don’t rely on fuels like propane and natural gas. Electrical infrared heat is in no way a substitute for a furnace or heat pump, however. Heating your home with infrared panels would be very expensive, but in a small, infrequently-used space like a garage, they do quite nicely. One thing we at Modernize have always admired is the enterprising spirit of many solar homeowners. So we weren’t surprised at all to learn that they’d engineered their own stripped-down solar garage heater—made out of recycled soda cans, no less! The plan is for a passive heater made with soda cans, an old window, and some insulation. 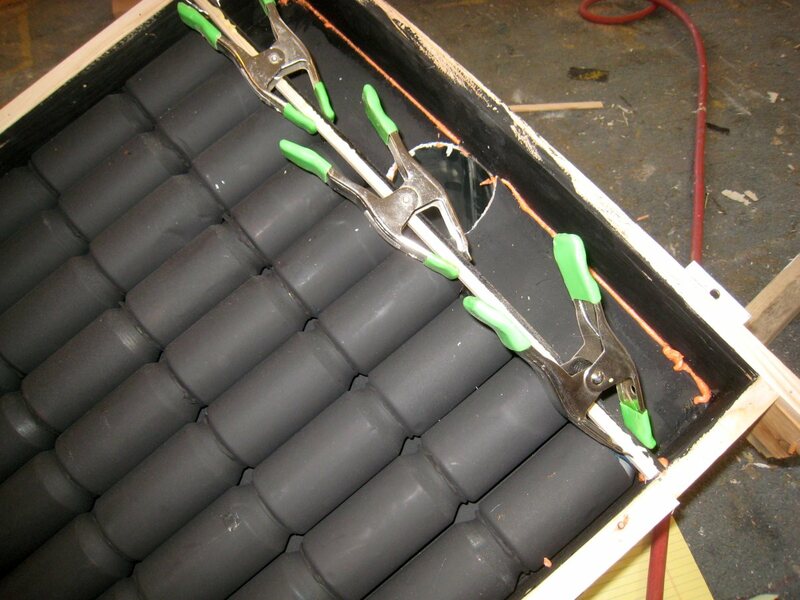 It works like this: the cans are painted black to better absorb heat, and then holes are drilled in the bottom to allow air to flow through them. Then they’re insulated and placed under the window. The sun shining through the window heats the painted aluminum, causing the air inside them to rise and travel through the stacks out the top of the cans. That action pushes the warmed air outward to you—so you can stay nice and toasty while you do some work on your car. Bare in mind that this is a passive solar heater, so it really only works when the sun is out. If you need your garage at night, you’ll be better off opting for an electrical unit with a solar panel or a solar heater with backup battery power. Still, the idea of creating your own heater is pretty darn cool. If that doesn’t earn you some extra handyman cred, I don’t know what will!